ASHWATER'S SECOND FULHAM SCRAPBOOK STILL AVAILABLE - SEE BELOW. Fantastic book full of so many great pictures that rekindle so many memories. Loved it - many thanks. Well printed and bound too! High standards maintained, as always - wonderful book. Looks like another masterpiece. So many great photos and memorabilia. Thank you both very much. Always class from Sir Ken and Martin. Another gem of a book. Thanks again for bringing such wonderful memories to life again. Well, we thought that we perhaps didn’t have enough pictures in the archive to produce yet another book of Fulham photographs. However, in the event it was more of a case of what can we leave out? You’d asked for another scrapbook - and here it is! There are again many unusual pictures in this new scrapbook, which has been further adorned with input from many of Ashwater’s Fulham friends. There are tribute pages to Ray Lewington, Stan Brown, Les Barrett, George Cohen, Alan Mullery, Bedford Jezzard and Reg Matthewson; there’s Fulham’s 1966 tour of the Far East, our only visit to Southport, that Lincoln game, players with fans, a spotlight on photographers, a couple of goals against us (boo! ), Fulham behind the scenes, press cuttings, plenty of memorabilia and curiosities and another quiz page of grounds FFC have visited. Of course to complement all this, there's page upon page of Fulham action and goals. A veritable smorgasbord of delights. The book is as before A4 in size with 144 pages and contains over 340 photographs, including lots that have never been seen before or have been glimpsed just once in the club programme. To order a copy, we offer options via PayPal, using the buttons below. You can also pay for your copy by cheque. Details here. You can also buy the book via Amazon. Link here. 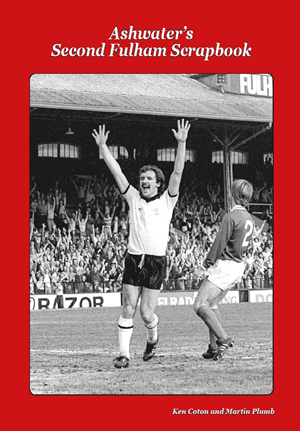 And … the book is available via the Fulham club shop. To order one copy to be posted to you, please use this button. To order TWO copies to be posted to you, AT SPECIAL DISCOUNT PRICE, please use this button. If you have any queries, please go to our CONTACT page.